It’s difficult to pick out the most disturbing feature of the Obama administration’s expanding use of unmanned drones in its continuing war on “terror” in at least 5 countries. Would it be that the pilots, sitting in Texas or Nebraska, “watch” targets across the world for hours or days, and then go home for dinner with the kids? That their slang term for human beings they’ve hit is “squirter?” That the C.I.A. 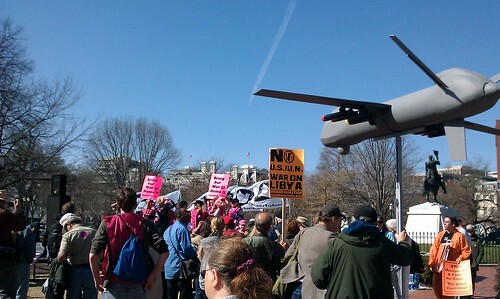 minders of one of the U.S. drone programs claim “no” civilians are killed? Or that there’s no oversight, no budget limit, no one in the upper levels of government who is even disturbed by this inhumanity? I’d go for all of the above, and together, they are only one reason I’m calling you to protest on October 6, and in the days after, at the outrage of 10 years of aggressive war and occupation of Afghanistan by the United States. See World Can’t Wait protest plans, October2011.org, and 10 Years and Counting. On May 6, a Central Intelligence Agency drone fired a volley of missiles at a pickup truck carrying nine militants and bomb materials through a desolate stretch of Pakistan near the Afghan border. It killed all the militants — a clean strike with no civilian casualties, extending what is now a yearlong perfect record of avoiding collateral deaths. Or so goes the United States government’s version of the attack, from an American official briefed on the classified C.I.A. program. Here is another version, from a new report compiled by British and Pakistani journalists: The missiles hit a religious school, an adjoining restaurant and a house, killing 18 people — 12 militants, but also 6 civilians, known locally as Samad, Jamshed, Daraz, Iqbal, Noor Nawaz and Yousaf. The Telegraph U.K. reported that at least 168 children killed in drone strikes in Pakistan since start of campaign, although all concerned know how difficult it is to count the victims of the secret drone campaign. In the first seven months of the year, 51 U.S. drone strikes in Pakistan have killed at least 443 people, according to a report by Conflict Monitoring Center. The report showed that the two deadliest months were June and July, when 117 and 73 people were killed respectively. One of the deadliest attacks was carried out on July 11 and 12, when four air strikes killed 63 people, the report said. Controversy has surrounded the drone strikes as local residents and officials have blamed them for killing innocent civilians and motivating young men to join the Taliban. Details about the alleged militants are usually not provided, and the U.S. government does not comment on the strikes. The Bureau of Investigative Journalism found that 2,292 people had been killed by US missiles, including as many as 775 civilians. The CIA claims that there has been not one “non-combatant” killed in the past year. This claim always seemed to be biased advocacy rather than honest fact. Indeed, the Guardian recently published some of the pictures we have obtained of the aftermath of drone strikes. There were photos of a child called Naeem Ullah killed in Datta Khel and two kids in Piranho, both within the timeframe of the CIA’s dubious declaration. All of this, done in our name, must be stopped by people acting in this country who know that American lives are not more important than the lives of other people, and that this outrageous war is fundamentally against humanity’s interest. This entry was posted on September 20, 2011, 12:25 am and is filed under protest and resistance. You can follow any responses to this entry through RSS 2.0. You can leave a response, or trackback from your own site. Obama Adopting Targeted Killing AND Interrogation on U.S. Naval Ships? The United Nations… of Drones? Hello… State Dept? Aggressive War is the Supreme War Crime.